The taxonomy of a plant is sometimes extraordinarily convoluted. Not so with this standout, for which the taxonomy is mercifully straightforward: The scientific name is Hosta 'Patriot' (the latter is the cultivar name). Just flip those two words around to form the common name. "Plantain lily" and "funkia" are old common names for hosta but are rarely used now. This foliage plant is an herbaceous perennial. A variegated plant and medium-sized, at maturity it stands 1-2 feet tall with a width approximately twice that. It has a mounding habit. Variegation here takes the form of white-colored edges surrounding a green center. The ovate leaves exhibit a wavy edge that, combined with the somewhat rippled surface (on mature plants), gives them quite a bit of character. In mid-summer, it produces lavender flowers, which some people find appealing. Other gardeners grow the plant purely for its leaves. Patriot hosta is typically listed as a plant for partial shade, but it is able to take more sunlight than a green or a blue type of hosta. Provide this ground cover with a well-drained soil, but keep the ground moderately moist. It will thrive in rich earth, so work some compost into the soil. You can grow Patriot hosta in planting zones 3-8. Due to their shade tolerance, another possible use for them is in the woodland garden. You can also take advantage of the coarseness of their leaves' appearance to inject contrasts in texture into your plantings. Divide Patriot hosta in early spring in order to propagate it or if you feel that it is outgrowing its space. If you do not care about the flowers, go ahead and deadhead them and let all of the energy go to the rest of the plant. As alluded to above, probably the best way to fertilize this type of plant is with organic soil amendments. What pests unpatriotically eat this short ground cover? These would be the same garden pests that plague the genus as a whole. The diminutive pests that attack 'Patriot' are slugs and snails. At the other end of the spectrum, they are infamous for being deer food: Not only do deer eat them, but they are a favorite food of these big, mammalian pests. Patriot hosta is a popular sport (mutation) of a plant that was (and is), itself quite popular: namely, 'Francee' hosta (not to be confused with 'Frances Williams'). 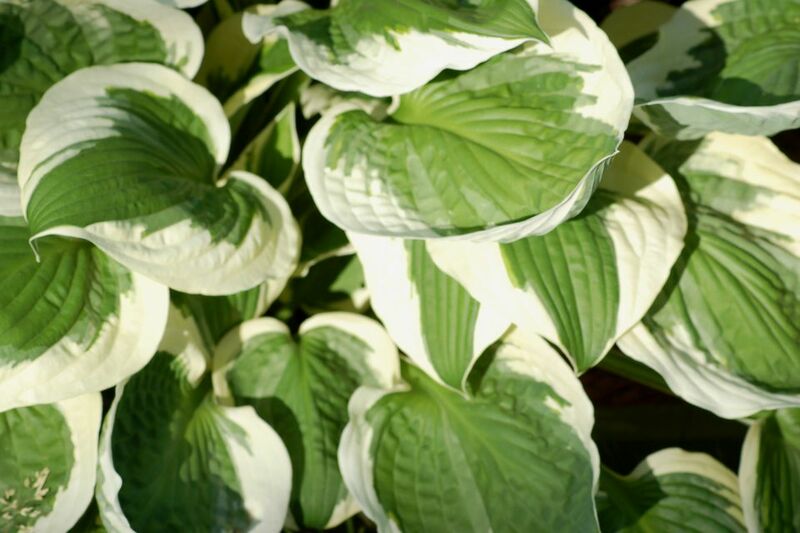 The American Hosta Growers association puts out an award every year for the best plant of the year, and Patriot hosta scored the victory in 1997. The Difference Between Minuteman and Patriot? 'Minuteman' is another variegated specimen with a green center and white margins. It is very similar to Patriot hosta: Both are Francee sports, and they reach a similar mature size. The color of Minuteman's leaf centers may be a slightly darker green, and the white color of its margins may be slightly more intense than those of 'Patriot.' The leaves may also be a bit thicker. But unless you are a die-hard aficionado of this genus, the differences are so slight that it probably is not going to make a difference to you which one you end up growing. If, however, you are going to begin a collection of hosta plants and will be putting time and energy into keeping all of the different types straight in your mind, one can't emphasize enough the importance of buying plants that have labels and maintaining a close association between each plant and its corresponding label -- at least until you have exercised your identification muscles enough to wing it. Veteran collectors will tell you how frustrating it is to realize, after the fact, that you really do not have a precise identification on a variety that you have been growing for years. Making sure the plant that you are buying has a label (and that the seller is a reputable source) is step one, at least. Step two is keeping track of that label during the process of bringing the plant home and transplanting it into your landscaping. Step three is securing a label such that it will remain as firmly rooted in the soil over the years as your plant is. The tiny labels plants are sold with at the garden center are flimsy and can easily become dislodged over time and blow away. You may want to make your own plant markers once you get your plants home -- something more rugged that will stand the test of time. The importance of fastidiousness in labeling must be emphasized because it is notoriously difficult to identify many of the varieties of this genus. There are just too many varieties that resemble each other too closely. 'Minuteman' and 'Patriot' hosta provide just one of the many instances of this fact.